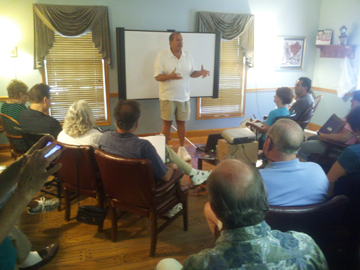 Chuck Piola, “King of Cold Calls,” training American Majority Action GOTV volunteers in Pennsylvania. At American Majority Action we believe that with billions of dollars””projected to be $5.8 billion by a recent independent analysis””to be spent on political campaigning such as television ads between now and Election Day, the importance of person-to-person, neighbor-to-neighbor campaigning takes on greater importance with each passing day. Simply put, voters will increasingly tune out political ads as we get closer to Election Day, as the sheer volume of these ads explode beyond imagination. Trust-based relationships (family, friends, neighbors, etc.) will matter more than ever as voters decide who they’re going to believe. The best scientific evidence suggests that person-to-person, neighbor-to-neighbor, door-to-door campaigning””followed closely by volunteer phone calling””is the single most effective means to et marginal, swing voters out to support your candidate of choice. Unfortunately, the left and organized labor have understood this much better than those of us who believe in limited government and individual liberty. With this in mind, AMA hosted two Get-Out-the-Vote (GOTV) trainings in Pennsylvania this past Saturday in the Pittsburgh and Philadelphia areas. We sought to honor the Constitution on its 225th anniversary by giving ordinary citizens a vision of how to make a maximum grassroots impact this year. Enthusiasm is far more important than eloquence. If you demonstrate enthusiasm and sincerity when reaching out with a message to people by phone or at their front door step, this will compensate for any lack of eloquence you might feel you have, especially with all of the slick, poll-tested messages that bombard voters. Ask these voters to help you help our country. “Hey, can you help me out? I’m really concerned about the direction of our country and I’d like to talk to you for a minute about it.” Asking for their help at the beginning of the conversation will break down some of the initial barriers they have in talking to political campaigners. In a sense, you are asking them to join you in helping restore this country… simply by having a short conversation. Overcome rejection and motivate yourself by thinking of those who gave the ultimate sacrifice for our nation. When rejection comes, as it most assuredly will sometimes when you’re doing grassroots campaigning, Chuck said to think of those who’ve given the ultimate sacrifice for our country. Think of our men and women in the America’s armed forces who gave their lives to defend our liberty. Think about our ambassador to Libya who was murdered along with three American diplomats. When our nation’s founders got involved in politics, they risked their lives. In modern times, we risk our comfort levels, our feelings and perhaps a little bit of our ego. Find your inspiration, grab a hold of it, and press on. This report was brought to you by: Martin Gillespie, American Majority Action Executive Director. For information on how to get involved, contact Martin at Martin@am-action.org or check out American Majority Action’s Liberty Headquarters.